Psychologist of 28 years, Marnee Loftin, shares 15 activities to help bridge the gap between concrete and abstract thinking for children with vision impairment (VI). Maria is in the second grade [year three in the UK] and uses braille for most of her learning, and some audiotapes. She was quite successful in first grade with an impressive memory, quoting stories verbatim and answering questions quickly. At the end of second grade Maria’s teacher is quite concerned about her difficulty with comprehension of stories. While she can list the names of those in the story and specific actions taken, she can’t state why a particular action occurred or the overall meaning of the story. For example, when reading a story about elephants and the problems they experience in captivity, Maria can only understand that elephants perform in circuses. Maria is exhibiting some difficulties in school that are often noted in children with VI. As the world (and academic tasks) becomes more complex, they begin to experience more difficulties in performing at their potential. 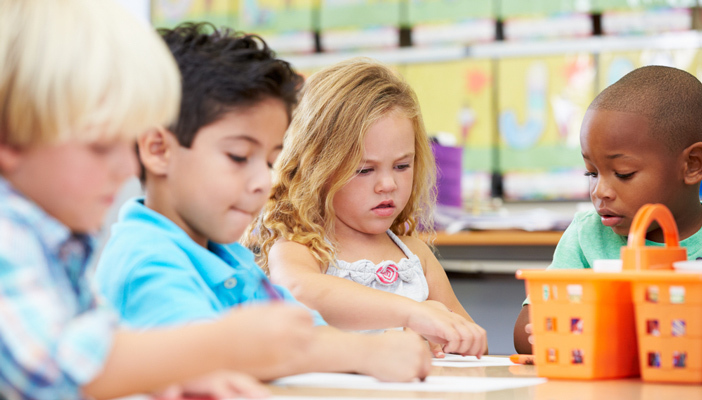 These problems may be related to a specific learning disability or cognitive abilities. However, it may also be a problem in moving from concrete to abstract ways of thinking. In abstract thinking, children learn to engage in problem solving, allowing them to classify objects and deal with concepts that aren’t immediately present in their world. Abstract thinking allows a child to broaden the concept of “dog” to a broader concept of animals. Children can add new information to a previously-learned concept, for example animals can be household pets or wild animals. Children develop the ability to master new concepts they haven’t directly experienced, perhaps understanding the meaning of freedom. Maria’s difficulty in answering questions about the theme of the particular passage about elephants represents a difficulty in abstract thinking. Many skills form the basis of abstract thinking. Developing each of these skills helps a child become successful in moving from concrete to abstract thinking. Ideally a child with VI learns these skills at approximately the same age as their sighted peers. However it’s still important to try to develop these skills in older children. What activities will help develop these skills? Although some suggest that abstract thinking can’t be taught, there are a multitude of activities that’ll encourage a child to develop this skill. Encourage dramatic play with use of real, as well as representational, items: Begin by focusing on familiar stories and previous experiences. Continue by acting out how future events might unfold. Develop new stories to be acted out using these items: Encourage the format of beginning, middle and end of a story. Give words to your own thoughts: When you prepare a meal or an activity, verbalise in brief comments the steps that you’re taking. When solving a particular problem, provide words to describe the steps you’re taking to solve the problem: Keep the language short, but clearly related to your solution. Try to get your child to think of new ways to use a familiar object: For example, ask about different ways that you might use a single egg that's in the refrigerator. Use everyday situations and ask a child to think about the reasons why it occurred and possible solutions: If you’re out of milk, ask child to develop ways that you can deal with the problem, ways you might avoid the problem. Keep the problems simple and relevant to everyday situations. Help your child think of analogies in relationship to everyday life or favourite books: Ask the child to identify stories reminding them of the current story, what book have they read that also reminds them of another story. Identify the similarities between the two books or ask the child to clarify their thinking. Develop problem-solving skills that can be used in multiple situations: With an older child, encourage comparing one situation to another that's been experienced. Provide structure, such as asking who was involved, what occurred, what might’ve been other responses, how other responses might’ve impacted the situation. Keep questioning to a minimum, but help the child see how different responses might’ve occurred. Evaluate the efficiency of these responses in relationship to the situation, i.e. did it help solve a problem? When teaching abstract concepts, employ the thinking-aloud strategies used at an earlier age: Talk through your explanation stopping at discrete steps. Try to compare abstract concepts to real-life situations. For example, when discussing different branches of government, relate these branches to aspects of a family. Summarise the specific ways in which they’re alike, as well as different. Realise that it’s much easier for a child to focus on ways in which situations, objects or concepts are different: Encourage them to look for similarities, even in items or events that are quite different on the surface. Use real objects at the beginning, so that similarities will be obvious. For example, ask the child to determine ways in which a flower and a carrot are the same. Talk about how real life experiences are the same as one another: Start with experiences that’ve many similarities and move to experiences that are seemingly quite different. For example, talk about the similarities between a trip to the supermarket and the dentist. Encourage creative thinking in determining similarities between these situations, objects, or concepts: Perhaps develop one list that could be considered “Silly Similarities”, as well as one that is more reality-bound. Help the child evaluate the “success” of a particular experience: This helps identify the emotions that the child is feeling, as well as giving a sense of independence from the feelings of others. Prior to this activity, help the child develop a limited number of characteristics (i.e. no more than four) of a successful (or pleasurable) activity. Plan a party together: Divide responsibilities into four parts, such as planning, inviting, hosting, and clean-up. Ask the child to determine three different activities within each of these responsibilities. After the party is completed, ask the child to review the responsibilities. Which tasks weren’t necessary? Which tasks should’ve been included? Development of abstract thinking skills is a critical factor in ensuring academic success and dealing with the complexities of life. Intervention is most effective when problems are recognised, interventions are planned, and both teachers and parents are consistent in implementation of strategies. Source: This article originally appeared on Paths to Literacy and has been republished with permission of the author. What do the terms "concrete thinking" and "abstract thinking" really mean? How do children move to abstract thinking? What are issues that affect moving into abstract thinking? Can we control the extent to which a child develops the ability to exhibit abstract thinking? Are there special issues associated with visual impairment? How do I know that educational performance is being impacted? Why does this seem to be an issue for children with VI? Now I know that there is a problem, how can I help the child?